Introduction And Scene "Nu, zaboltalas ya!" Letter Scene"Puskai pogibnu ya, no pryezhde"
Servant Girls' Chorus "Dyevitsi, krasavitsi"
Entr'acte And Waltz With Chorus "Vot tak syurpriz!" Introduction, Scene And Lenski's Aria "Nu, shto zhe?" Closing Scene "O! Kak mnye tyazhelo!"
. . . [an] elegant and untricksy production . . . a beautifully detailed and sensitively characterised reading of the piece, Chekhovian in atmosphere and period . . . Anna Netrebko gives an irresistibly wholehearted performance as Tatyana . . . full of ardour and sincerity -- a match for Mariusz Kwiecien's handsome dog of an Onegin, sung with crisp precision and musicality. Singing is superb throughout, with Anna Netrebko a sensitive troubled woman who resists temptation and resigns herself to her comfortable life minus the passion she originally felt for Onegin, and, of course, she is beautiful to look at. Mairusz Kwiecien is a handsome Onegin, Piotr Beczala an ideal Lenski . . . Video and audio are excellent . . .
. . . Anna Netrebko convincingly projects the teenage Tatiana's inwardness and sensitivity, singing with a voice much enriched since her early coloratura days. Piotr Beczala, bookish and intense as Lensky, is deeply moving during the humiliating party scene and duel . . .
. . . the production recounts the story in a straightforward, dramatically effective manner, without flashback, doubles, or other "Regietheater" devices. The pivotal episodes, such as Tatiana's letter scene, the confrontation between Onegin and Lensky in act II, the duel scene, and the final scene between Onegin and Tatiana, are powerfully sung and acted . . . Musically, the performance is excellent . . . Anna Netrebko's portrayal of Tatiana is a powerfully dramatic one, and she has the vocal strength and beauty and variety of tone to bring it off. As always, she is a fine actress, and she conveys the character's emotions convincingly and movingly in both visual and vocal terms. Her letter scene is a stunning piece of dramatic vocalism . . . Mariusz Kwiecien is a persuasive Onegin, projecting in his vocalism the dignity and self-possession the character should have. His singing combines beauty and solidity of tone with sensitive expressivity . . . As Lensky, Piotr Beczala deploys a more powerful, heroic voice than is common in this role, rescuing the character from the impression of weakness and petulance that clings to him in many portrayals. Here is a Lensky who moves rather than embarrasses me, and I have no hesitation in declaring him one of the best practitioners of the role in my experience . . . [Beczala] is passionate without being saccharine, anguished without being lachrymose, combining beauty and purity of tone with precision and dramatic fervor. His two arias are superbly rendered . . . Conductor Valery Gergiev is in top form, with leadership that is flexible, nuanced, impassioned, and detailed. The famed Met orchestra executes his commands with the expected eloquence and precision, and the chorus displays its customary proficiency . . . The stereo sound of this Blu-ray disc is vivid, well defined, wide in dynamic range, and free from harshness or distortion. The voices are very clear and well-focused, unhampered by excess reverberation. The balance between voices and orchestra is ideal, allowing for a strong and detailed orchestral presence that never covers the singers . . . Picture quality is excellent . . . this performance moved me deeply. With the best overall cast . . . it is compelling as a musical and dramatic experience. This one is very good . . . [upping the time period from that of Pushkin to that of Tchaikovsky] works very well, and the sets and scenery in this new production are exquisitely nuanced, yet rich and colorful without being over the top or gaudy. The focus does what focus should do in this opera -- accentuate the emotional trappings of the characters and allow the music to penetrate the psychological aspects of the threadbare plot . . . Dramatically the opera works very well, the final scene as riveting as it can get . . . very enjoyable . . . enjoy Netrebko's glorious rendition.
. . . [Netrebko] is a lovely Tatiana, her voice full and warm, her manner earnest. She's believable in her transformation from the naive young ingenue to the dignified Princess Gremin . . . Kwiecien is a handsome Onegin . . . He sings cleanly and strongly, in an appealing light baritone. Beczala's Lensky combines Slavic flow with Italianate warmth . . . Volkova brings a rich bottom register to Olga's music . . .
Anna Netrebko im Triumph . . . [sie] überzeugte als Tatjana . . . [da stand sie nun] wie festgewurzelt, nur langsam fortgerissen in einem nie gekannten Gefühlssturm, der in der nächtlichen Briefszene, dem immer noch schönsten erotischen Erwachen der ganzen Opernliteratur, wie eine Naturgewalt aus ihr herausbrach. Netrebkos dunkel glühende Stimme mit dem festen Kern und dem angenehm sich verbreitenden Höhenvibrato scheint dafür ideal geeignet. Sie hat sich Zeit gelassen mit der Tatjana, jetzt schon ist sie ganz die ihre. Das hört man spätestens in der Petersburger Ballszene. Da war sie die Königin der Gesellschaft . . . Das steigerte sich im vokalen Finalduell bis zum Schrei -- schön, wohlig, verzweifelt und doch gefasst. Ein weiterer totaler Netrebko-Triumph, eingerahmt von einem fast komplett russisch sprechenden Ensemble, angeführt von [Piotr Beczala als Lenski] . . .
. . . Anna Netrebko est une immense chanteuse . . . [sa couleur] ménageant le froid et le brûlant, libérée par une technique que l'on devine affermie; son âme enfin, des vacillations adolescentes au chavirement de la femme, tout est là, sans afféterie. Pas de calcul, pas de pose, pas même la volonté de plaire au metteur en scène. Entre Anna et Tatiana, c'est une histoire de feeling: et nous, on le sent . . . [Mariusz Kwiecien] est un habitué du rôle ; sa composition fleure bon le travail appliqué . . . La voix, elle, n'admet pas de récriminations: timbre évocateur, phrasé ductile, langue claire . . . [Piotr Beczala]: de la fougue, de l'empressement, de l'adolescence ; et puis quelle belle voix . . . [la suite du cast] est d'un niveau supérieur . . . De la fraîche Olga d'Oksana Volkova au Prince sentencieux d'Alexei Tanovitski, seul dépare un Triquet manifestement à côté de son sujet. A distribution superlative, orchestre scintillant (Valery Gergiev tire le meilleur de la phalange américaine, sans effets de manche ni excès de sentimentalisme) et mise en scène intemporelle. Décors et costumes sont raffinés, picturaux . 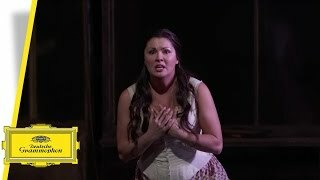 . .
Watch Anna Netrebko as Tatiana from the MET new staging of Tchaikovsky's passionately lyrical masterpiece Eugene Onegin, released on DVD and Blu-ray. The DVD/Blu-ray features Anna Netrebko in one of Russian opera's greatest and most demanding roles - Tatiana. 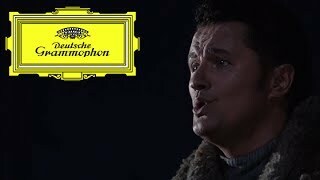 Watch Piotr Beczala as Lenski from the MET new staging of Tchaikovsky's passionately lyrical masterpiece Eugene Onegin. 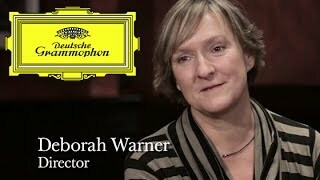 Watch Deborah Warner talk about the MET new staging of Tchaikovsky's "Eugene Onegin".